I'll dispense with the fine details already covered in other articles and go straight to the likes, dislikes, and wishes. You're going to like the crisp, 4-1/2 pound trigger that is far better than standard Browning / Winchester repeating shotguns: no trigger job required here. It is also quite a bit better than the Benelli Ethos models and the Remington VersaMax for that matter. You'll also like the safety, and you'll love the fact that the dual gas piston area shoots extremely clean and can go who knows how long between cleaning. 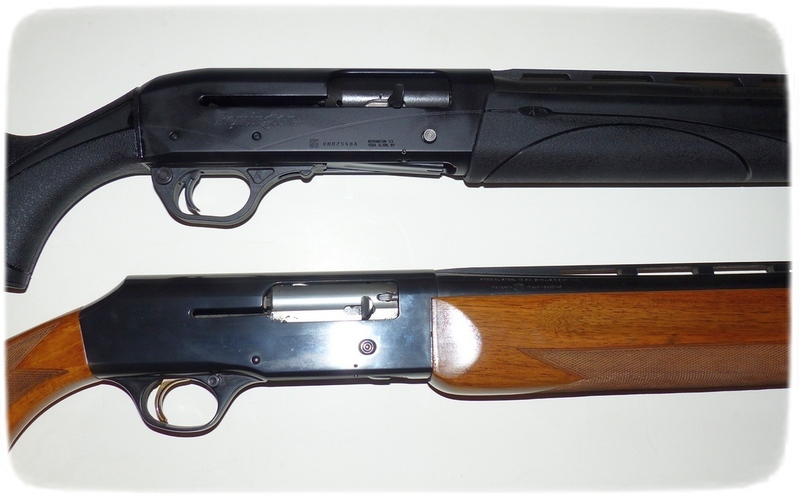 In the above image, the oversized safety button and generously sized trigger guard of the V3 is readily apparent compared to a Browning B-80. You're going to love how soft shooting it is without resorting to the various springy stock things. The SuperCell pad is as good as the best, and better than the rest. As for rating the felt recoil, that of course depends on how you feel about it. With 1 oz. loads, the V3 is roughly equivalent to the SX3 / Browning Silver / Maxus line, the softest-shooting gas guns in this weight class for many years. It is too close to call, according to my shoulder anyway. With 3 inch shells, the VersaPort system does a better job of compensating than the “Activ Valve,” and feels a bit softer . . . as well as having generally less shock and vibration: a steady diet of heavy loads is not as abusive to the V3 as it is to other models where the bolt speed gets out of hand. It is far softer shooting than the Beretta Outlander, for example, and clearly more comfortable to shoot than inertia guns. No, it is not as soft-shooting as the far heavier VersaMax: primarily because of the V3's lighter weight. The 26 inch V3 is a far better-handling gun than the 28 inch V3 and if it was up to me, the V3 would soon be available with a 24 inch barrel. As the V3's gas system comes right from the cartridge chamber, barrel length can be as short as wanted without changing function or reliability. The top of the receiver of the V3 is drilled and tapped for bases or a rail. It is, of course, a blessing for those who wish to add optics down the road: for the wingshooter or clays shooter, it means a whole lot less. The trigger guard is larger than many models as is the safety button. For cold or gloved hands, this is a very good thing. The stock design is generally quite good. Many Euroguns have combs that are far too wide, as far as I'm concerned, but the V3 does not have this issue, or potential issue. The V3's composite stock has molded in swivel studs. Although understandable and common practice, metal studs are generally a better path. Although the stock envelope dimensions are very good, the molded-in fine stippling is not quite as grippy as I'd like, though this is matter of personal preference. This applies solely to this black synthetic V3 and may or may not be the case with the camo and walnut versions. The outline and silhouette of the V3 is fairly conventional, certainly more conventional then the more radical profile of the Benelli Vinci. Still, I feel the trigger-guard has needless insets with “R's” in them, and there could be some cosmetic help provided without any change in the fundamental design. Like everyone else, I'd like to see highly polished blue and a thousand dollar well-figured walnut stock set on a $750 or so street price gun, which is obviously not happening. Remington is going to sell millions of V3 autoloaders. Within the constraints of this aggressive price-point, the Made in the USA Remington is a home run: the most significant new Remington shotgun since the 1100. Much more to follow in Part Three.